We here at Mossy Ford Pacific Beach are very excited to show you how versatile the new Ford Transit Passenger wagon is. This popular full-size passenger wagon can be configured to meet your needs. It's available with multiple wheelbase lengths, three different roof heights, and numerous seating arrangements. 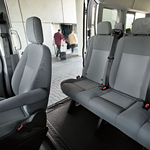 Drivers can build their Transit Passenger Wagon to seat up to 15 passengers comfortably. The various wheelbase lengths create room for more people. The standard build comes with seating for eight. The long-wheelbase model gives you enough room to get up to 12 seats. If you need the full 15 seats, the long-wheelbase extended-length vans have you covered. The height of the roof can affect your passengers' overall comfort. The low roof height is great if you don't need a lot of headroom. The medium roof height option provides a bit more vertical space to get through the cabin comfortably. If you want as much headroom as possible, you may benefit from the high roof height option.